Democrats can make as much noise as they want about President Donald Trump’s nominee for the Supreme Court, but they have few procedural weapons at their disposal to stop Brett Kavanaugh’s confirmation on their own — although they can make life difficult along the way. One strategy for the Senate Democrats may be to create as much time as possible between Monday night’s announcement and the Judiciary Committee’s confirmation hearings. Critics can seek to spread out the timeline so they can dig into the prospective justice’s background, writings and paperwork. As opponents did with former President George W. Bush’s ill-fated pick in 2005, Harriet Miers, they can work to demonstrate the candidate’s shortcomings and possible political ties. That also may mean mining the rule books to see how they can slow the committee process. But since the precedents were changed over the last few years, only a simple majority of senators is needed to break a potential filibuster. Judiciary Chairman Charles E. Grassley of Iowa has the discretion to schedule a series of hearings on Trump’s nominee. Democrats can press Grassley to delay hearings so members of the panel can review all documents related to the confirmation. One quirk of the Senate’s rules that might come into play is that it requires permission of all senators in order for committees to meet for longer than two hours after the Senate convenes. Hearings for Supreme Court nominees run much longer than that, so any one Democrat could object for committees to meet beyond the customary two-hour start. Majority Leader Mitch McConnell of Kentucky would then need to start manipulating the chamber schedule to accommodate the long hearings. Trump announced his intent to nominate Associate Justice Neil Gorsuch to fill the seat vacated by the death of Antonin Scalia on Jan. 31 of last year. Hearings kicked off March 20, 2017. The committee voted to report Gorsuch on April 3, and the whole process ultimately took 66 calendar days. On that timeline, assuming the White House sends over the nomination paperwork this week, the committee vote could happen in early September. Under committee rules, any senators may ask for consideration to be deferred one week. The question will be whether or not Grassley can compress the timeline enough to get the successor to retiring Justice Anthony Kennedy seated before the start of the new Supreme Court term in October. Grassley thinks the job can be done on time. “When we were able to do it for most justices in recent years between 65 and 70 days, it seems to me we’ll be able to do it this time as well,” Grassley told radio reporters from his home state of Iowa last week. Grassley said that once again the Judiciary Committee would retain the services of additional lawyers to help review the record. The total time frame has fluctuated a bit over time. For instance, it took a month between the time the nomination of Ruth Bader Ginsburg was sent to Capitol Hill and the beginning of Judiciary hearings. It can, however, stretch to two months, as it did for Samuel A. Alito Jr., a George W. Bush appointee nominated when Republicans were in the Senate majority, and Stephen G. Breyer, who was nominated when Bill Clinton was president and Democrats controlled the chamber. While the panel can meet, it does need a quorum of senators to conduct business, meaning at least one Democrat would need to be present. So Democrats could just not show up, but they did not use this tactic when the panel considered Gorsuch in 2017. Barring any massive mistake by the nominee or a fatal revelation, the 11 Republicans on the panel can advance the individual out of committee as long as they stick together. 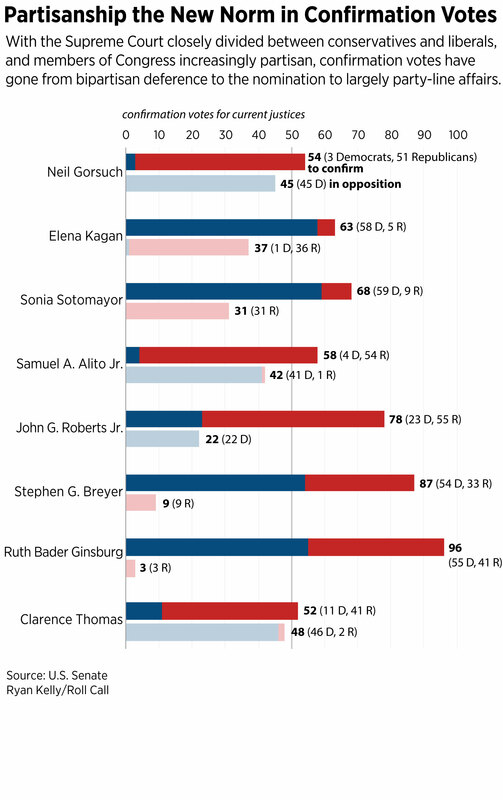 Democrats hold only 10 spots on the Judiciary Committee. Once the nomination makes it to the Senate floor, Democrats could then deploy certain parliamentary tricks to slow things down in the chamber. For example, a quorum call is a common sight for those watching the Senate on C-SPAN. In order to conduct business, there should be a simple majority of lawmakers present. With the ongoing absence of Sen. John McCain for health reasons, this could cause GOP leaders a problem. Democrats could insist that a quorum be established, which essentially means the clerk may need to run through the roster of 100 senators to see who is present. This could eat up significant floor time if done on a regular basis. Democrats also could just refuse to show up in the chamber. That could trigger a motion to instruct the Senate sergeant-at-arms to compel the presence of absent members. There is a history of legislative quorum-breaking, though as University of Miami Professor Gregory Koger has explained, it hasn’t been all that prevalent since the 1800s. Something similar happened in a famous 1988 incident when former Democratic Leader Robert C. Byrd of West Virginia ordered the arrest of absent members and had them brought to the floor. When Capitol police found former Republican Sen. Robert Packwood of Oregon, they carried him feet-first into the chamber to establish the quorum during debate over campaign finance legislation. But as it turns out, he didn’t make it that difficult, as he was in his office.